Encapsulates colored aggregrates to form a waterproof surface coating of stairways, walkways and balconies. Seals broadcast aggregrates on boat decks, dock surfaces and gangways. Waterproofs, protects and encapsulates tiles, pavers and synthetic or natural composite flooring. Can be used over concrete, fibreglass composite, insulation, most metals, mineral composites, wood, wood composites, rubber, plastic composites, slate, tile and other surfaces. Surfaces must be dry, free of dirt, loose debris, oils, grease or any substance that could interfere with adhesion. Do not apply if the substrate or air temperature is predicted to drop below 35°F (2°C) within 4 hours after application. The application surface must remain at least 5°F (3°C) above dew point during the application and curing process. 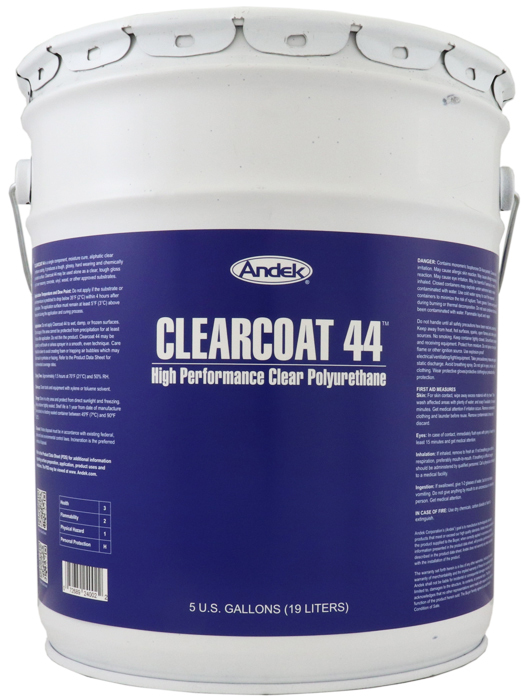 Do not apply Clearcoat 44 to wet, damp, or frozen surfaces. Do not apply if the area cannot be protected from precipitation for at least 4 hours after application. Do not thin the product. Clearcoat 44 may be applied by soft brush or airless sprayer in a smooth, even technique. Care should be taken to avoid creating foam or trapping air bubbles which may later result in pinholes or hazing. Store in a dry area and protect from direct sunlight and freezing. Keep container tightly sealed. Shelf life is 1 year from date of manufacture when stored in a factory sealed container between 45ºF (7ºC) and 90ºF (32ºC). Waste disposal must be in accordance with existing federal, state and local environmental control laws. Incineration is the preferred method of disposal.